It's the wonderful Belle of the Beauty and the Beast! 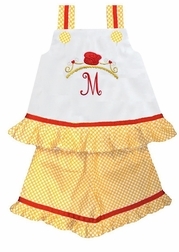 Here we start with a pretty white fabric dress or swess top (2 inches longer than a regular swing top) and trim it with a yellow with white dots ruffle and shoulder straps. 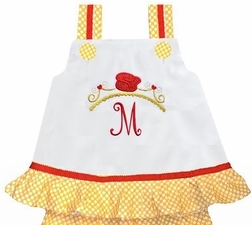 The ruffle and shoulder straps are embellished with red scalloped edge ribbon. On the front of the dress/top, we applique the lovely golden crown with a red rose in the center. 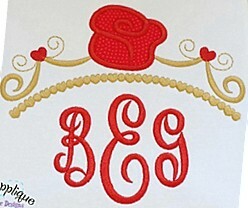 Under the crown is your little one's 1 or 3 initials in Fancy Script font. 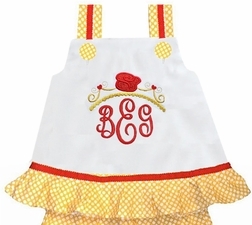 The top is paired with shorts made of the yellow with white dots fabric and also is trimmed with a ruffle and red scalloped edge ribbon.